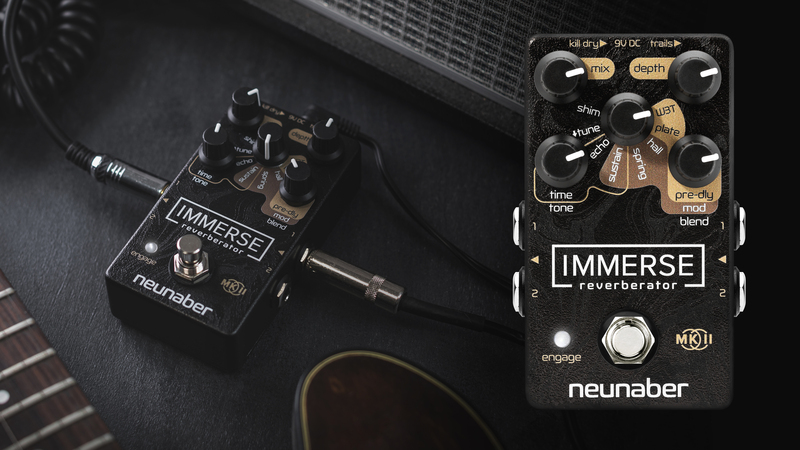 Orange, CA – October 2, 2018 – (GuitarPR) – Neunaber Audio has announced the release of its all new Immerse Mk II, representing the very best in pedal reverberation. Following on the success of its original Immerse pedal, Neunaber has completely redesigned the Mk II from the ground up with all new circuitry, upgraded algorithms and much more. Like its predecessor, the Mk II features stereo inputs and outputs that can be used mono or stereo. In addition to external Kill Dry and Trails switches, the pedal offers five controls that include Effect Selection, Mix, Depth, and two multi-function controls. Reverb effects include W3T™ (Version 3 of the Wet algorithm), Plate, Hall, Spring, Sustain, Echo, Detune and Shimmer. The Immerse Mk II also implements a high-quality buffered bypass. The signal is always buffered whether engaged or bypassed because the last output in the pedal chain should be buffered. The Mk II is available at selected Neunaber dealers in the US and internationally. It is also available direct from Neunaber for $249 at https://neunaber.net.